Sameboat Project - Black Man Don't Float? Black Man Don't Float? 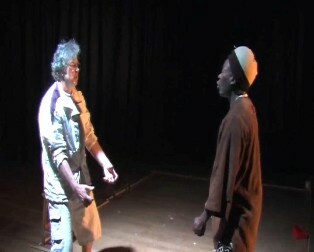 is a performance collaboration between established arts professionals and international academics committed to the principles of theatre for development, reconciliation and conflict resolution. Martin Hubbard is a performer, writer and academic lecturing at University College Falmouth, the University of Exeter and Plymouth University. His mix of theory and performance practice ensures vibrant work that is both inviting and intellectually engaging. 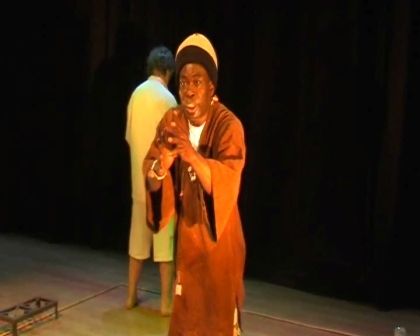 Osita is senior lecturer in African Theatre at Goldsmiths University in London. 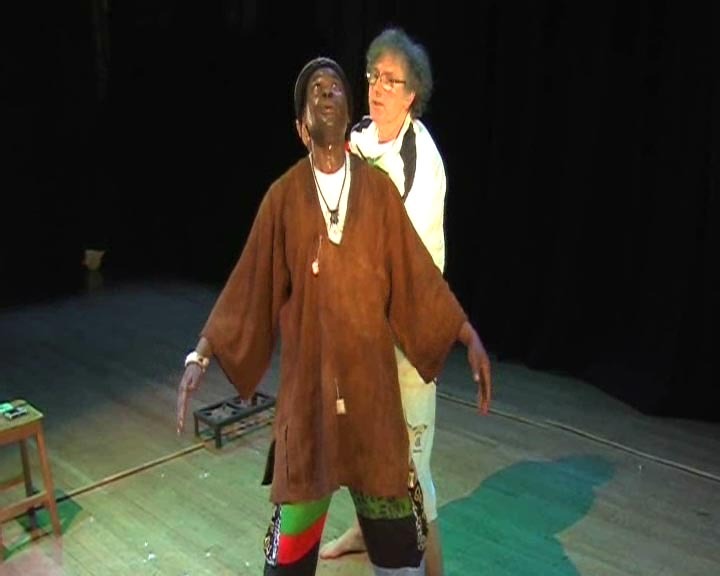 He has taught African Theatre, Cross Cultural Studies in Performance, Performance Theory & Practice at the universities of Nigeria at Nsukka and Plymouth at Exmouth. He is the founding President of the African Theatre Association (AfTA) and founding Editor of African Performance Review (APR). The Sierra Leone Diaspora Network (SLDN) is a multi-disciplinary,non-partisan, non-denominational team of highly skilled professionals dedicated to addressing & influencing economic, environmental and social issues and processes in our home country. We work in partnership with the Government of Sierra Leone (GoSL) and its relevant agencies, national and international NGOs, the private sector and local communities, with the aim of encouraging and effecting long-term and sustainable development in Sierra Leone. Black Man Don’t Float? is a highly physical show usually performed on a boat, which is coming ashore to UK schools and studio theatres in Autumn 2008 and 2009 as part of an epic voyage across stages, oceans and continents. You remember all that time I was telling you about Europe? Tonight is going to be good – there is going to be nice sunshine, there is going to be no moon. Tell Sedu and Brima: tonight we are going. In the ocean off Africa, a white yachtsman collides with an economic migrant who is trying to reach the Canaries in a rickety home-made vessel. Black men don’t float. They are dead. No point going back for dead people. The two men have to co-operate to survive, but their differences appear overwhelming. The sea they see is not the same sea. They are confined in a small space under a vast sky, but are they in the same boat?. The sea that I see is not the same sea that you see, White Man. Me and my brothers risk our lives just to be on the edge of what you’ve got. Black Man Don’t Float? helps UK audiences understand why African migrants are leaving their continent in search of the European Dream. 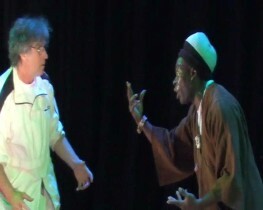 When performed in West Africa, the show seeks to prevent Africans from drowning in poorly planned and equipped voyages. The water will come up your face, but stop before your mouth and nose as long as you keep your arms and legs down. The show lasts 45 minutes without an interval, requires a playing space of 8ft by 8ft and simple studio lighting and sound facilities. We will take the bodies back to their villages in Africa and bury them in the earth and tell people that no more young men should drown in this sea. The Sameboat Project is a not-for-profit organisation committed to using cross cultural art and performance for reconciliation, participation and community building. We are not seeking to generate commercial profits from the theatrical tour of Black Man Don’t Float?, but we do need to generate income of £500 per day while on tour to cover the production and administration costs of this project. This fee includes actors’ wages, travel costs, accommodation, administration costs and contingencies. We are open and flexible with regard to financial arrangements made with host venues and happy to work closely with partners to ensure the performance meets everyone’s needs. We are happy for venues to set their own workshop fee for participants in order to offset the costs of the show. Black Man Don't Float? 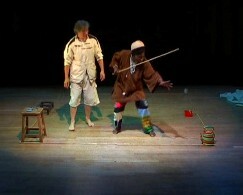 has been devised by performer Ayodele Scott and writer/performer Martin Hubbard. Ayo is from Freetown, Sierra Leone, and began acting on the street. 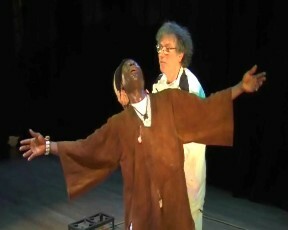 He trained with the Sierra Leone National Dance Troupe, Kailondo and Tabula Theatre Companies, and won the Progress National Actor of the Year Award before coming to the UK as a performer, where he has lived and worked as musician, drummer, dancer, actor and workshop leader for the last 20 years. Ayo is also lead percussionist with the multicultural music group Baka Beyond. Helen is a member of Gecko Theatre. David is the director of the ARROW Programme at The Desmond Tutu Centre at the College of St Mark and St John in Plymouth. The programme is a response to the events of September 11th 2001, the build up to war in Iraq and increasing racial tensions here in Britain, with the intention to foster the systematic development of the creative arts as a resource for reconciliation, cross-cultural understanding, peaceful reconciliation of conflict and the encouragement of a deeper understanding of the crucial principles of interdependence. The programme seeks to challenge negative myths and enhance the ability of people to identify key priorities for global development and peace.